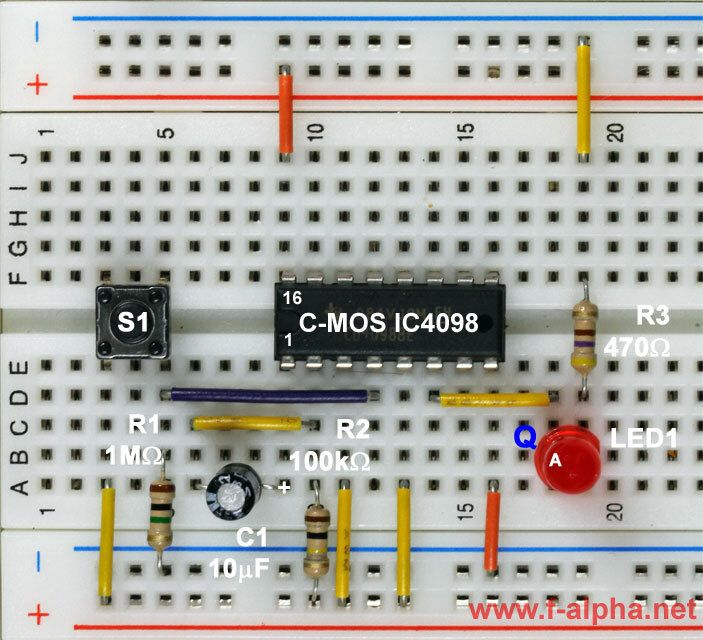 You can build a monostable multivibrator, or monoflop, by using a logical integrated circuit, on which the monoflop is already pre-programmed. With the circuit shown, you build the monoflop with the C-MOS 4098, which contains two monostable multivibrators. Circuit diagram of a rising-edge-triggering monoflop. Once you press the pushbutton switch, the LED lights up and goes out after about half a second. This behavior corresponds to the transistor circuit of the Experiment 7. The Monoflop responds directly to the pushbutton switch. It is triggered by a rising edge, as you can see in the illustration to the right.